The MLIT, Ministry of Land, Infrastructure, Transport and Tourism, Japan, specified to apply a water repellent material having a contact angle of greater than 140 degrees for coating the surface of XRAIN, the weather X-band MP radar radomes. This is for a counter measurement against water film attenuation caused by a heavy rainfall. The radomes of XRAIN have been coated with HIREC. The XRAIN which has high resolution and quasi real-time observation has been installed to reduce damage from localized heavy rain and torrential downpour. The XRAIN is able to observe localized heavy rain in detail and in real time while a C-band radar is suitable for the observation over a wide area. Even a light rain forms a water film on the surface of a radome, which causes signal reduction. 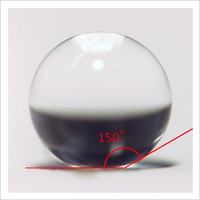 The water film thickness changes depending on rainfall intensity, radome material, surface condition and so on. The figure shows an estimation of water film thickness formed on 5 m diameter radome, uniform smooth surface, without hydrophobic coating. Rainfall of 30 mm/hr, for example, may form a 0.2 mm thick water film on the surface. Notable signal reduction due to a water film on the radome during heavy rainfall periods caused extreme narrowing of the observational range. 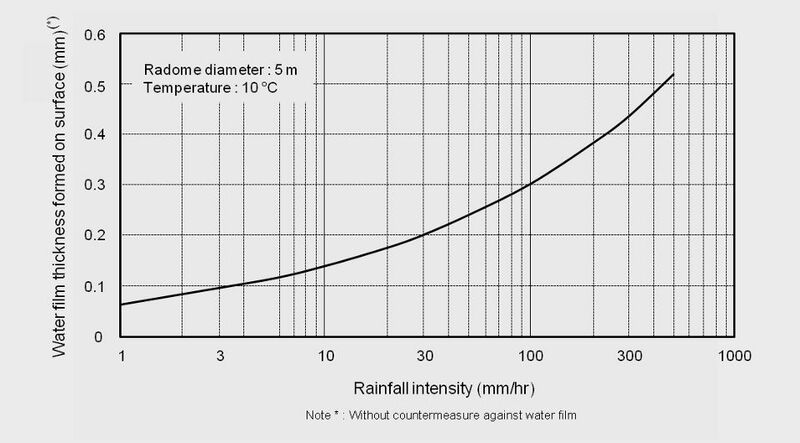 Rainfall of 30 mm/hr, for example, may form a 0.2 mm thick water film on a radome surface, resulting in a 5.0dB attenuation. The observation range was narrowed to 10 km from 80 km in normal condition as shown in the figures. HIREC having with super water repellency and durability proved over 20 years actual achievement in social infrastructures. HIREC coating creates a contact angle of 150 degrees between the surface and water droplet, and has a self-cleaning mechanism, which realizes water repellent surface about 3 years. HIREC has been adopted to X-band MP radar radomes of XRAIN as a key countermeasure against water film attenuation.